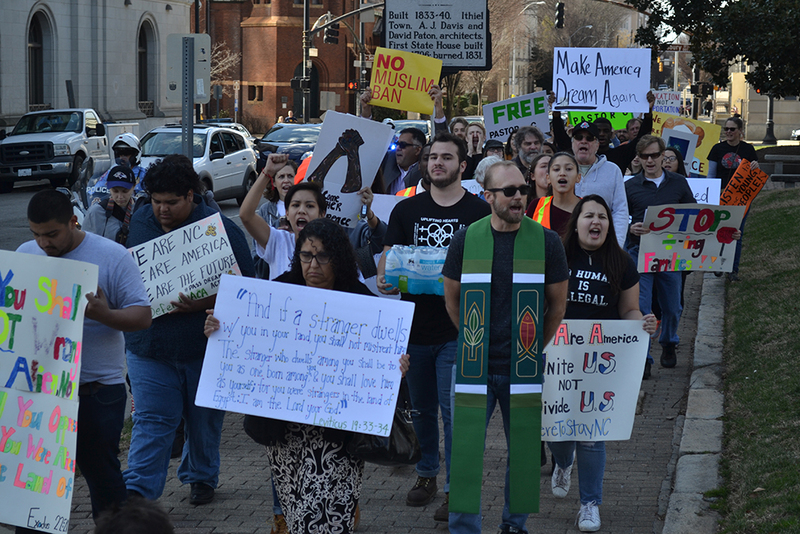 Protesters march from the Wake County Justice Center up to the North Carolina State Capitol building to show their support for immigrants who are facing deportation despite being model citizens during the Sanctuary Everywhere rally on Saturday, Jan 27, 2018. Immigration has become a hot topic under the current presidential administration of the United States. Swift changes in our nation’s immigration policies have resulted in high amounts of media attention regarding immigration and the immigrant experience. However, the immigrant narrative displayed by major media publications seems to be dominated by the stories of brown Latinx immigrants from Central and Latin America. While this narrative serves as representation for the majority of the United States’ Latinx immigrant population, it severely neglects and underrepresents the experiences of black immigrants. According to the Pew Research Center, there are approximately 4.2 million black-identifying immigrants in the United States, and this population is steadily increasing. These immigrants often migrate from the Caribbean and Africa. Despite the growing presence of black immigrants in the United States, their underrepresentation in the media has remained the same and the lack of media representation for these immigrant groups has had lasting effects on black immigrant youth. “Having a greater black immigrant narrative in the media would have made growing up as an immigrant in America much easier,” said Sylvie Uwineza, a second-year studying psychology. “Not seeing people who look like you or have families like you makes it hard to relate and just made me want to detach from my culture completely. Uwineza’s family migrated to the United States from Rwanda when she was less than one year old. She says her family still maintains aspects of their culture despite living within the United States. While her family has not received outright discrimination because of their assocation with a foreign culture, Uwineza stated that the general public’s lack of knowledge surrounding African cultures can lead to bias. Underrepresentation in the media results in a general lack of knowledge towards black immigrant groups. This lack of knowledge combined with the United States’ long history of discrimination towards black people makes for an intensified amount of discrimination towards black immigrants. Because of this double minority status that many black immigrants carry, Uwineza is not alone in her experiences. Naomi Ejim, a fourth-year studying Africana studies and biological sciences, says she has personally experienced discrimination as a second-generation black immigrant in the United States. The senior’s parents migrated from Nigeria in the early 80’s and 90’s. According to Ejim, her family has also faced discrimination for their cultural ties to their homeland. Ejim says that her parents often get asked culturally insensitive questions, and her younger brother who has a more ethnic first name has decided to go by his more American middle name. She says he does this to avoid ignorant questions and comments about the family’s culture. Both Ejima and Uwineza feel as though their status as second generation black immigrants have made them a target for some sort of discrimination, whether implicit or not, and this discrimination was often based on ignorance. Luckily for the two, they have gained pride for their respective cultures on their own. Black immigrant kids like Ejim and Uwineza will most likely continue to deal with ignorance surrounding their culture unless major media publications begin to provide more representation for this underrepresented narrative.